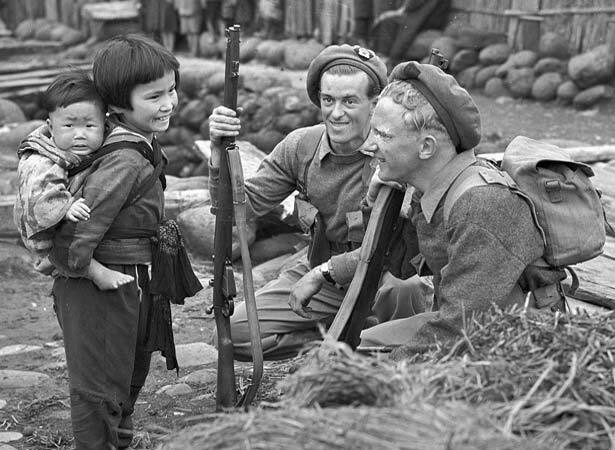 After Japan’s surrender in August 1945, the New Zealand government agreed to participate in the US-led occupation as part of a Commonwealth force. More than 4200 New Zealand troops under the command of Brigadier Keith Stewart arrived in March 1946 as part of a 35,000-strong British Commonwealth Occupation Force (BCOF). Known as Jayforce, this infantry brigade was complemented by 280 personnel of No. 14 Squadron RNZAF who had volunteered to serve in Japan. Commonwealth units occupied about one-seventh of Japan’s land area, the United States the rest. The Commonwealth troops had two key roles: overseeing Japanese demilitarisation and demobilisation. Jayforce was initially deployed in Yamaguchi prefecture on the southern tip of the main island of Honshu, and on nearby Eta Jima Island. This was a relatively poor rural area with a population of 1.4 million – not much less than New Zealand’s total population at the time. The New Zealanders’ first task was to search for military equipment. Little was found, as Yamaguchi had not had a major military presence during the war. Jayforce also assisted with the repatriation of Japanese who were coming home and Koreans being returned to their country. The Italy draft of Jayforce was essentially made up of conscripts, and unsatisfactory conditions in Japan added to their sense of resentment. Boredom was a major problem, but as non-fraternisation rules were progressively relaxed high rates of venereal disease also became an issue. The Italy draft was relieved by a draft of volunteers from New Zealand in mid-1946, and this draft was relieved in its turn in mid-1947. A total of about 12,000 New Zealanders served in Japan, of whom 15 were killed in accidents or died of disease. They are buried in the Commonwealth cemetery at Yokohama. When Great Britain and India withdrew from the BCOF in 1947, enthusiasm for New Zealand’s ongoing involvement alongside Australia waned. An April 1948 decision to withdraw from Japan was implemented by early 1949. We have 9 biographies, 17 articles, related to Main body of Jayforce lands in Japan.